I'm still feeling a bit knocked around from this darn cold so here is a little blog post I had saved in my drafts for the proverbial rainy day. Hope my readers are still interested in my Barbie collection! I love the multi-directional stripes in this strapless number. The ribbons on mine have seen better days but, overall, this dress is in very good condition. I love the use of colour in this plus it has pockets and ric-rac! Tiny little ric-rac on the teensy pockets. So cute. If only it came in my size! Sigh. The attention to detail in these vintage Barbie dresses is so impressive. The little bow, the layered fabric with a trim that matches the underlay...and they're so well constructed, too. Clockwise from top left: Theatre Date #959; Senior Prom #951; Busy Morning #956; Barbie-Q #962; Mood for Music #940; Country Fair #1603.
oh god! I love them all. I'll have one of each outfit in human size please. these are wonderful, it's so refreshing to see Barbie in stylish grown up clothes rather than pink princess dresses! Have you seen this Barbie wearing Dior's new look from 1947? oh dear god, that ginger freckly Midge is just TOO good! LOVE Barbie! YOu have an amiazing colection, I also would like to have those clothes for me hehehe! You have such a lovely collection. Fabulous! I love how the mimic actual vintage dresses (for big women!) I've seen. Especially the blue and red ric rac dress. I love the pink dress that comes with the straw hat! Great inspiration for sewing. Wow, I can't believe how fantastic the outfits are! I would definitely like those in adult size. I hope you're feeling fighting fit soon! Barbie was always astonishingly stylish, and to think people sewed, knit and crocheted teensy little fashions for her. I've always thought that was amazing. I want the rick-rack trimmed dress and the pink striped sundress me-sized! What a stellar vintage Barbie collection, Andi. I'm a huge toy lover myself, and though I scaled back my collection a ton a few months ago (sold off to help raise funds for our move), I'll always adore toys and dolls, especially vintage ones (mine we modern - doubt I could have parted with vintage ones! ;D). Thank you very much sharing you thoroughly awesome collection with us, dear gal! I actually have the dress to the Senior Prom set--but not the shoes (though I'm sure I could hunt them down on Ebay). Found it when I was a teen for $0.50 at a thrift store! i have recently gotten into vintage barbie stuff after seeing a beautiful collection for sale at an estate sale! 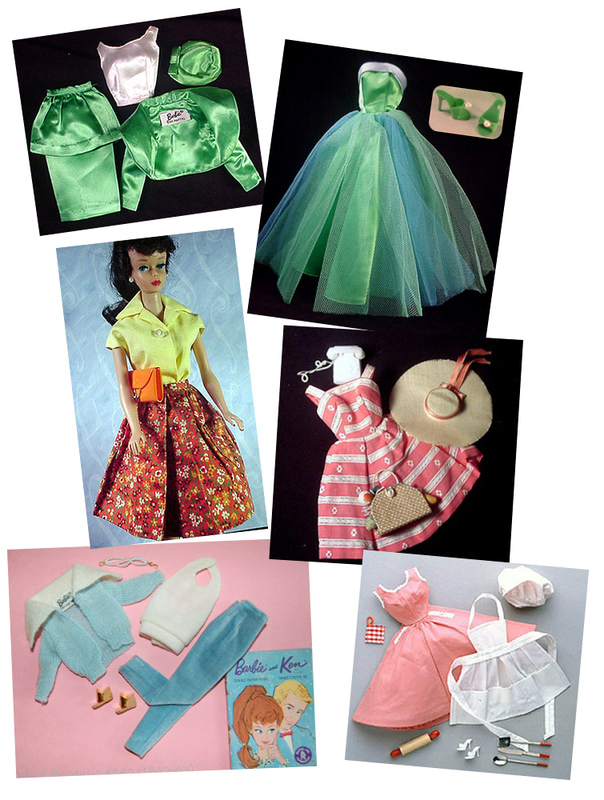 the vintage clothes are so much prettier than the barbie clothes i had when i was a kid in the 80's. i own two of these dresses....would love to sell!